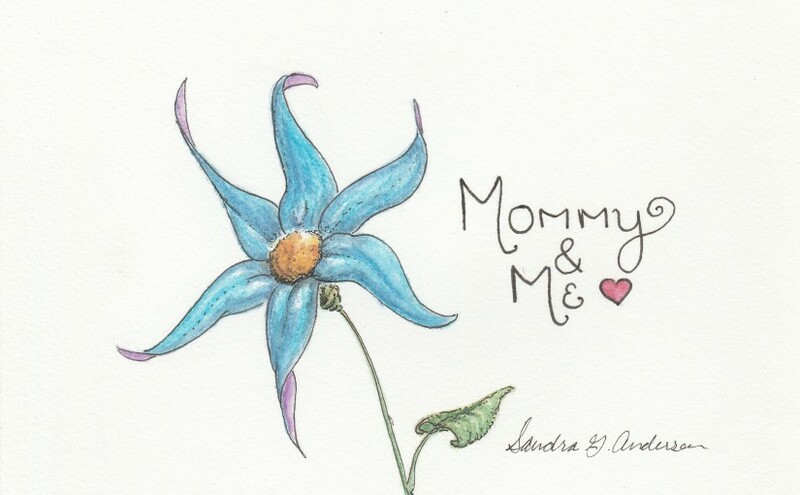 Sandra G. Anderson Illustration > Mommy & Me > Ready for the Clue? Thanks again for your eager participation on the last “Mommy & Me” contest! I hope you all had as much fun as I did. I am happy to announce that this is the second contest (woo!!) and everyone is invited to leave a comment with their guess! As I mentioned last time your vote is only valid if it’s on this page. It’s been a while since I’ve had some inspiration about what I would do next, but it finally came and I’m so excited for the big reveal!! The other important item to have ready is a varnish spray that you can put on your finished pieces to prevent yellowing or fading. I recently bought some that I’m hoping to use soon. There are gobs of paraphernalia you can buy for whatever medium you’re working with, but these are some basics that I would recommend. Now for the fun part! Are you ready?? MrsAnderson1267 on Watercolor Illustration goal: MET! Ryan on Watercolor Illustration goal: MET!